Here Anthony adds the finishing touches to some tattoo lettering, an acquired skill that takes years to master. I mentioned previously that the tattoo artists had been evicted from their shop on Sackville Street to make way for a commercial development, they have since found new premises and will be opening shortly on Young Street Halifax. Good luck to them. This entry was tagged Halifax, Newcombes Ink, Nova Scotia, tattoo. Bookmark the permalink. Ouch…this one made me wince! 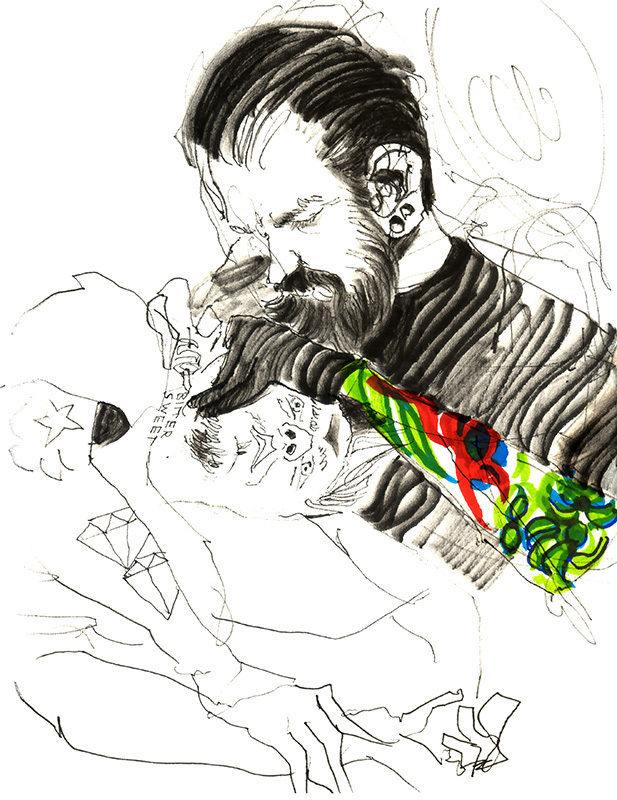 Not the drawing per se, but the fact that it looks as if he’s getting tattooed on his NECK! Yikes! I do like the color added only in the arm tattoo! That looks painful, great drawing. Yeah, looks like he’s suffering a bit. Thanks Martin. Regards, Russell. I surprised myself by getting the foreshortened view of the head right. I remember thinking to myself.’You’ve got to box clever now, draw what you see, draw what you see..’ Thanks as always for dropping in, Russell. Thanks for the follow….you do inspire me to keep at it…..! You’re welcome. Great drawing of the rowing boat, Russell.